In the mid 1990s I wrote a short article that I called Mediation Ghost Stories: Exorcising the Presence of Absent People, which was reprinted several times in various training manuals. The issue was ‘authority to settle’ when the negotiating parties in the room had to report to or get consent from people who were not in the room. I referred to the missing people as haunting those who were present, that is, as ghosts in the mediation. After giving the various scenarios clever names, I offered a few suggestions on how to exorcise them from the room. A decade later, I have more questions than answers about exorcising those ghosts. There are not many more solutions in the literature than I found a decade ago. After a lot more experience and research, my reluctant conclusion is that conflict resolution theory does not deal all that well with mediation ghosts. The issue is alive and well and still perplexing, whether it is categorized as limited authority to settle, hidden agendas, power imbalance or any other impediment created by missing people who exert influence from afar over those who are physically present at the mediation. Like astronomers finding distant planets by observing the way the light wobbles and changes through their gravitational interaction, I see the influence of absent people by how people in the mediation wobble and change – or not - in response to the negotiation interactions. The parties present in the room might want to change positions as they learn together, but they are still caught in the ‘gravitational pull’ of a powerful or remote or unknown absent decision-maker. That ghost exerts influence yet, through its absence, is unaffected by the adaptive learning that those present go through as they mediate. Using conflict theory we have few choices for who is legitimately a party to the mediation; we often do not have input into which people volunteer or are sent. Harrison Owen made it a rule for Open Space Technology that “whoever comes is the right people”. Thus, we are left with few options but to try to minimize the ghosts’ influence so that the parties actually in the room can decide. The parties are there because they know something or occupy a position that is appropriate for the task. 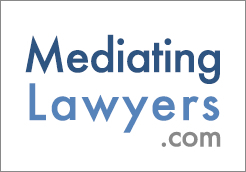 Where the mediation is private, we exclude those without a direct interest in the outcome, such as the media, friends of divorcing couples, or nosey neighbors. The consequence is that, as conflict analysts, we tend to decrease the amount of complexity of the conflict system as an aid to conflict resolution. However, complex adaptive systems such as conflicts are best understood through requisite variety, which means having at least as much complexity as the problem or issue to be discussed. Reducing complexity makes sense in low context societies, where relationships are considered private concerns between the people involved in the conflict, and in legal systems where the courts have to know who is potentially liable. It makes less sense when the parties excluded in context and law still have the ability to influence the conflict system’s direction while being relieved of responsibility for the direction the system goes. My current thought is that it is conflict resolution theory that is the barrier to exorcism, not conflict resolution practice. Mediators do the best they can with the people who show up. We need better theories to understand the dynamic that the present and the absent people have with each other and the effect that has on the mediation process. We treat the mediation process as a confidential matter between those who are named in the lawsuit, or are distraught about a relationship, or are having a difficult time communicating with each other. In other words, in consultation with the clients and the courts, we draw a boundary around the conflict and decide who is inside and who must remain outside. Victim-offender reconciliation facilitators long ago figured out that the boundary can encompass a village. Public participation theory can cast its stakeholder boundary around entire ecosystems. Mediation theory still constrains the boundaries, which complexity science calls ‘attractors’, beyond which the conflict system does not travel. Attractors can create ‘basins’ that trap the system in a series of motions endlessly cycling in repeating, but not exactly replicating, patterns at each pass around the boundary. Sometimes theories show up when you need them most, and complexity science came onto my radar screen just before I started my doctoral research. It added richness to my conflict analysis and has been indispensable to my practice ever since. It has remade how I think about conflict systems, media, adaptation, the importance of small details, power, (I’ve written several articles analyzing power and conflict using complexity science), and outcomes. Conflicts are complex adaptive systems, which means they are dynamic and nonlinear. In nonlinear systems cause and effect are not always directly linked, proportionate or predictable. In studying conflict from a complexity science point of view, the ghosts in the mediation take on a new dimension. If I were writing Mediation Ghost Stories now, my approach would not be to exorcize the ghosts but to metaphorically invite them and their friends in. Conflict theorists might ask who has an interest in the matter. The traditional parties to mediation are those who are ‘for’ or ‘against’ an issue or position. Authority to settle means that the negotiator warrants that s/he will sign on behalf of and get the ghosts’ consent to the resolution. Those are reassuring words that mediators rely on in order to proceed. By drawing the boundaries around the parties in the room, the influence that the ghosts play can be ignored; complexity is reduced and we carry on. We respect that the parties to mediation have the right to draw boundaries around the stakeholder groups they chose to involve. Complexity science deals at a systems level, rather than the constituent parts of systems. There could be a more complete list of who is ‘in’ the conflict by including the real and varied sources of power that have the ability to influence the mediation or its outcome. In a complexity science analysis, I include agents who have the ability to generate perturbations that can amplify and thus affect the course of the conflict. It is unlikely that conflict theory would encourage the expectation that ghosts, such as the news media, or the police, or union members who expect jobs if a resolution succeeds, or Human Resource professionals who have to implement the resolution, or parents-in-law or nosy neighbors, should then join the mediation as parties. However, from a complexity science frame of reference, those ghosts have direct, as well as indirect, impacts on how the physically present parties set their strategies and conduct their negotiation. Their impacts deserve to be part of the initial and ongoing conflict analysis. Thus, while conflict theory is concerned with who has authority to bind the parties if they are negotiating a settlement to their conflict, or who represents the public interests, complexity science analysis might additionally consider the interests and/or power of the agents in a system with the ability to add inputs that might affect the direction of the conflict system. In nonlinear systems, simply adding an agent or a seemingly small input to the system can change that system. The act of adding an input to a system could alter the conditions within that system enough that it was no longer possible for the input to affect the system in the manner intended. That is worth our attention as conflict analysts. Using a complexity science analysis meant that I can include the unlikely as well as the likely agents in the conflict analysis. This gave a more complete picture of who was having an effect on the conflict relationship, and how that effect was interpreted and acted upon by the other agents in the conflict system. Since parties might take the news media into account in their strategies, it makes for a deeper analysis to be able to explore the news media’s interests and impacts, even though they are not ‘parties’ in the traditional conflict theory usage of the term. It makes sense to expand the conflict analysis so that all the inputs, all the different sources of power and all the agents who have the possibility of creating, amplifying or dampening a cascade effect within the system can be included where warranted. There is a practical difference between a conflict analysis exploring the co-evolution and adaptations in an interactive conflict system and a conflict analysis seeking a better conflict resolution. It is often an on-going conversation among the interveners, during the design of a conflict process, to decide where to draw the boundary around who should be included in order to keep the numbers manageable and the parties representative. A complexity science analysis does not yet have that concern. It is almost a purely analytical tool at this point, although complexity science methodology and process are evolving. Since conflict processes can be unwieldy in size and number of people, I am not suggesting that all the agents to a conflict that complexity science would include should also be part of any conflict resolution process. Complexity science’s significant contribution to conflict analysis, although it is unrelated to the practicalities of designing manageable conflict resolution or public consultation processes, has implications for protracted conflicts when agents in, for example, families, social networks, corporations, non-governmental organizations, news media, or government institutions, are adding influential inputs to the conflict in some way, while not parties to or involved in the conflict. Complexity science exposes the influence of allegedly non-involved agents and expands our conflict analysis, which leads to better conflict management.